The English word spirit comes from the Latin "spiritus" ("breath") and has several interrelated meanings: Metaphysically, a spirit is an incorporeal energy force that is present in all living things but distinct from the soul. (The distinction between soul and spirit became current in Judeo-Christian terminology.) A spirit may also be a ghost that retains intelligence, consciousness, and sentience. In Christian theology, the term spirit is used to describe God, or aspects thereof, such as the Holy Spirit. (The study of the Holy Spirit in Christian theology, is called Pneumatology.) In native spirituality, the word "Great Spirit" is often used to denote the supreme nurturing force found in nature: This concept of spirits infusing nature is common among traditional peoples. In Zoroastrianism, the Amesha Spenta are seen as emanating spirits of Ahura Mazda. In Christian Science, Spirit is one of the seven synonyms for God. It can mean the "spirit of the age"
It can be a synonym for vivacity as in "She performed the piece with spirit," or "She put up a spirited defense"
It can denote the underlying intention of a text as distinguished from its literal meaning, especially in law. The Letter vs. spirit of the law. It can be a term for alcoholic beverages stemming from medieval superstitions that explained the effects of alcohol as demonic activity. In Mysticism, it can refer to existence in unity with the Godhead. The English word "spirit" comes from the Latin spiritus, meaning "breath." The word was loaned into Middle English in the thirteenth century via the Old French word, espirit. In Christianity, a distinction was made between soul and spirit. The Greek word pneuma was translated as "spiritus" in the Latin Vulgate instead of anima (soul), which was rendered psykhē. This distinction between spirit and soul reflected in the Greek and Latin languages (that is, Greek psykhe vs. pneuma; Latin anima vs. spiritus) ultimately derives from the Hebrew, which itself embodies a distinction between ruach (breath/wind) and nephesh (soul). There are related concepts to spirit in other languages such as the German, 'Geist' (related to the English word ghost) and the French, "l'espirit." Sanskrit uses the terms akasha and prana (breath). Similarly, both the Scandinavian languages and the Chinese language uses the term "breath" to refer to the spirit. In the Bible, the word "ruach" is most commonly translated as the spirit, whose essence is divine. The belief in spirits is closely tied to the ancient concept of animism, which attributed spirits to everything in nature, including human beings, animals, plants, and rocks. It was widely believed that spirits were composed of a misty, airy, or subtle material. Anthropologists speculate that this may stem from early beliefs that spirits were the person within the person, most noticeable in ancient cultures as a person's breath, which upon exhaling in colder climates appears visibly as a white mist. This belief may have also fostered the metaphorical meaning of "breath" in certain languages, such as the Latin spiritus and the Greek pneuma. In the Bible, God is depicted as animating Adam with a breath (Gen. 2:7). If from antiquity to the present, and since the beginning of man, there are men who have seen the bodies of ghosts and spirits and heard their voices, how can we say that they do not exist? If none have heard them and none have seen them, then how can we say they do? But those who deny the existence of the spirits say: "Many in the world have heard and seen something of ghosts and spirits. Since they vary in testimony, who are to be accepted as really having heard and seen them?" Mo Tzu said: As we are to rely on what many have jointly seen and what many have jointly heard, the case of Tu Po is to be accepted. In other ancient cultures, the spirit was sometimes symbolically or literally depicted as a bird or other animal. In many historical accounts, the spirits of the dead (ghosts) were thought to be looking for vengeance, or imprisoned on earth for bad things they had done during life. Most cultures have ghost stories in their mythologies. Many stories from the Middle Ages and the Romantic era rely on the macabre and the fantastic, and ghosts are a major theme in literature from those eras. Pneumatology is the study of spiritual beings and phenomena, especially the interactions between humans and God. Pneuma (πνευμα) is Greek for "breath," which metaphorically describes a non-material being or influence. Pneumatology is defined as: "1. Theology, the doctrine of the Holy Spirit. 2. The doctrine of spirits or spiritual beings, in the 1600s considered a branch of metaphysics. 3. pneumatics. 4. Obsolete word for psychology." In Christian theology pneumatology refers to the study of the Holy Spirit. In mainstream Christian doctrine, the Holy Spirit is the third person of God in the Trinity. Unitarian forms of Christianity believe that the Holy Spirit is personal, although holding that it may, in some sense, influence people. In the Gospel of John, pneuma is linked to re-birth in water and spirit, which has been suggested to be baptism. 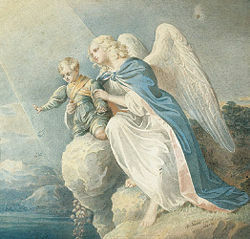 "Guardian Angel" (Schutzengel) (1840), by Matthäus Kern. "Never despise one of these little ones; I tell you, they have their guardian angels in heaven, who look continually on the face of my heavenly Father" (Matthew 18:10: New English Bible). The concept of guardian spirits or tutelary angels and their hierarchy was extensively developed in Christianity in the fifth century by Pseudo-Dionysius the Areopagite. The theology of angels, and tutelary spirits, has undergone many refinements since the 400s, and contemporary orthodox belief in both the eastern and western churches is that guardian angels protect the body and present prayers to God, protecting whichever person God assigns them to. The Roman Catholic Church calendar of saints includes a memorial for guardian angels on October 2. Whether guardian angels attend each and every person is not consistently believed or upheld in patristic Christian thought. Saint Ambrose, for example, believed that saints lose their guardian angels so that they might have a greater struggle and persevere. Saints Jerome and Basil of Caesarea argued that sin drove the angels away. The first Christian writer to outline a specific scheme for guardian spirits was the very popular twelfth century theologian Honorius of Autun (died c. 1151). He said that every soul was assigned a guardian angel the moment it was put into a body, although such a thought requires the preexistence of the soul/essence Scholastic theologians augmented and ordered the taxonomy of angelic guardians. Thomas Aquinas agreed with Honorius and specified that it was the lowest order of angels who served as guardians, and his view was most successful in popular thought, but Duns Scotus said that any angel might accept the mission. Guardian angels appear in literary works throughout the medieval and Renaissance periods. For example, the Anglican English physician and philosopher Sir Thomas Browne (1605-1682), stated his belief in Religio Medici (part 1, paragraph 33). A spirit or soul of a deceased person is often called a ghost, although the word ghost can also refer to any spirit or demon. A ghost is usually defined as the apparition of a deceased person, frequently similar in appearance to that person, and encountered in places she or he frequented, or in association with the person's former belongings. The Hebrew Torah and the Bible contain few references to ghosts, associating spiritism with forbidden occult activities (Deuteronomy 18:11). The most notable reference is in the First Book of Samuel (I Samuel 28:7-19 KJV), in which a disguised King Saul has the Witch of Endor summon the spirit of Samuel. In the New Testament, Jesus has to persuade the Apostles that he is not a ghost, following the resurrection (Matthew 24). In a similar vein, Jesus' followers at first believe him to be a ghost when they see him walking on water. One of the earliest known ghost "sightings" in the west took place in Athens, Greece. Pliny the Younger (c. 63-113 C.E.) described it in a letter to Licinius Sura: Athenodoros Cananites (c. 74 B.C.E.–7 C.E. ), a Stoic philosopher, decided to rent a large, Athenian house, to investigate widespread rumors that it was haunted. Athenodoros staked out at the house that night, and, sure enough, a disheveled, aged specter, bound at feet and hands with rattling chains, eventually "appeared." The spirit then beckoned for Athenodoros to follow him; Athenodoros complied, but the ghost soon vanished. The philosopher marked the spot where the old man had disappeared, and, on the next day, advised the magistrates to dig there. The man's shackled bones were reportedly uncovered three years later. After a proper burial, the hauntings ceased. Many Eastern religious traditions also subscribe to the concept of ghosts. The Hindu Garuda Purana has detailed information about ghosts, and the realms of rebirth in Buddhist cosmology contain a realm of hungry ghosts. Spirits are often visualized as being interconnected to all others and The Spirit (singular capitalized) refers to the theories of a unified spirituality, universal consciousness and some concepts of Deity. 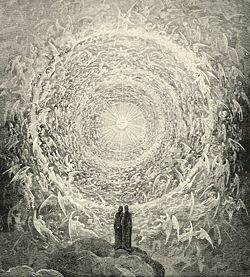 All "spirits" connected form a greater unity, the Spirit, which has both an identity separate from its elements plus a consciousness and intellect greater than its elements; an ultimate, unified, non-dual awareness or force of life combining or transcending all individual units of consciousness. The experience of such a connection can be a primary basis for spiritual belief. The term spirit has been used in this sense by at least Anthroposophy, Aurobindo Ghose, A Course In Miracles, Hegel, and Ken Wilber. In this use, the term is conceptually identical to Plotinus's "One" and Friedrich Schelling's "Absolute." Similarly, according to the pan(en)theistic aspect, Spirit is the essence that can manifest itself as mind/soul through any level in pantheistic hierarchy/holarchy, such as a mind/soul of a single cell (with very primitive, elemental consciousness), or a human or animal mind/soul (with consciousness on a level of organic synergy of an individual human/animal), or a (superior) mind/soul with synergetically extremely complex/sophisticated consciousness of whole galaxies involving all sub-levels, all emanating (since it is non-dimensional, or trans-dimensional) from the one Spirit. According to the doctrine of Spiritualism, spirits constitute or inhabit a world in itself; this world is called the Spirit World. The Spirit World is the main world and from this come all other worlds. This world is independent from our "material" world. Both worlds interact all the time, but are independent from each other. Through mediumship, these worlds can communicate with each other. The Spiritist philosophy affirms that we are, first and foremost, spiritual beings temporarily living in the physical realm with a purpose. The shared belief is that the human consciousness, or soul, continues to exist beyond the physical body. Therefore, life is defined as a continuous learning experience governed by a curriculum that calls for periods in the physical realm until such time that people have learned enough lessons to graduate to a spiritual existence in the spirit world. Given this perspective, Spiritism sustains the notion of a spiritual evolution, that supports the idea that the elements of the physical and spiritual realm are interconnected and continuously evolving. ↑ Mary Baker Eddy, Science and Health with Key to the Scriptures. p. 587. ↑ W.P. Mei, The Ethical and Political Works of Motse [Mo-tzu Retrieved December 19, 2006. ↑ World Book Encyclopedia, The World Book Dictionary. World Book, 2002. ↑ Catholic Encyclopedia, Guardian Angel. Retrieved April 2, 2008. ↑ The Free Dictionary, Ghost. Retrieved December 13, 2006. ↑ SIU News, Classical ghost stories by K.C. Jaehnig. Retrieved April 2, 2008. ↑ The Harvard Classics, Pliny the Younger (c. 62 C.E.–c. 113 C.E.) Retrieved April 2, 2008. ↑ Vedic, Vedic cosmology. Retrieved February 27, 2007. Burton, Ernest De Witt. Spirit, Soul, and Flesh: The Usage of … in Greek Writings and Translated Works from the Earliest Period to 180 C.E. University Of Chicago Press, 1918. This page was last modified on 4 April 2008, at 01:23.